2018 Training Camp came to a close Monday evening with Team Holtby winning their 4th straight camp game to claim the Kirkness Cup. A sentimental reward after a gruelling weekend for the 18 players on the winning squad. The trophy was presented by Bobby Kirkness, whom the trophy is named after. Bobby has been a staple in the Blades dressing room for decades and after winning his battle against cancer in 2016, Blades training camp has taken on a new name. However, the mini-camp tournament is just the beginning for players, staff, and prospects. Immediately following the on-ice sessions, players met with staff for exit meetings. 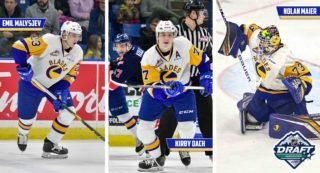 Blades GM Colin Priestner says they hope to get the roster down to around 35 players by the end of the night. The complete roster cut-down list will be published on Tuesday. 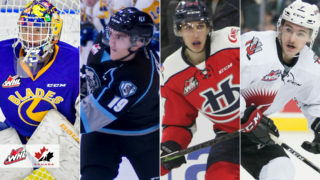 Next up for the Saskatoon Blades is pre-season action beginning on Thursday in Prince Albert with a “young guns” game against the Raiders. 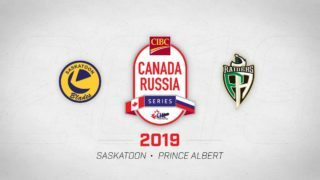 Fans in Saskatoon will have two chances to catch a glimpse of pre-season hockey on September 8th in Warman when the Blades host the Prince Albert Raiders. 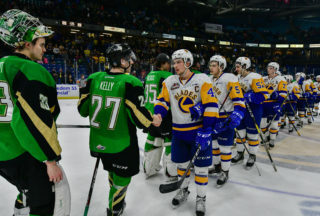 Tickets for the game in Warman are on sale now for $10 each at the Legends Arena in Warman or at the Blades office at SaskTel Centre. The Blades will also welcome the Regina Pats to SaskTel Centre on Thursday, September 13th. 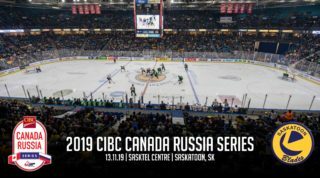 Contact the Blades office at 306-975-8844 for tickets or more information.